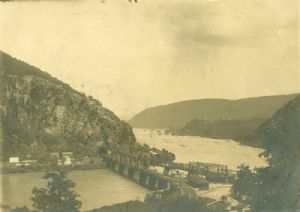 View from the hill above Harpers Ferry looking across the Potomac to Maryland Heights. The advertisement painted on the cliff reads Mennen's Borate Talcum Toilet Powder. There are advertisements on the bridge leading to the Potomac and Winchester branch, for Wilson Whiskey - That's all and for Kentucky Whiskey. The building near the lock on the canal has what appears to be A. Spencer & Co. painted on the roof. In a National Park Service Historic Structure Report titled The Stone House (Misnamed the Salty Dog Saloon) Opposite C&O Canal Lock 33, 1980, Edward Smith noted that Albertus Spencer owned land near Lock 33 before 1889. He sold groceries and animal feed from the storehouse near the canal. After the 1889 flood, he bought the Stone House and operated a store and saloon in the building for at least two more decades. When prohibition went into effect, Spencer built a two-story frame house adjacent to the Stone House and established his store in it. It is possibly this building that has A. Spencer & Co. on the roof.